Sound Healing is becoming more recognized in the field of wellness. Research has been accumulating for several decades on the benefit of utilizing sound for improving the healing potential of the body, mind and spirit. 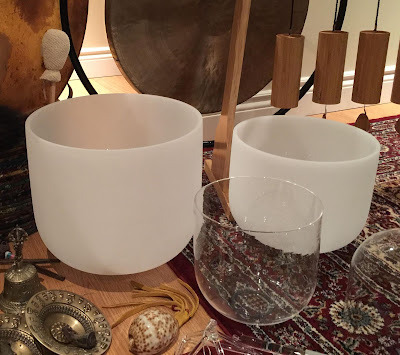 From ancient instruments like drums, bells, gongs and metal bowls, to more modern instruments like quartz crystal bowls, tuning forks and spirit drums, to music, vocal toning, chanting and singing, sound has always been considered a powerful healer. I use highly vibratory instruments of all kinds, for activation, relaxation and specific body healing purposes: Crystal Bowls, Himalyan Bowls, Bells, Koshi Chimes, Tuning Forks, Rattles, Drums, Gongs, Spirit Drums, and more. Curious? Attend a class or book a session. Descriptions below are style examples of both Group and Individual Sessions. Customized experiences are also available. A soothing sound experience designed to bring us through the classic stages of yoga nidra using sound as our guide. We begin with verbal guidance which shifts quickly to highly vibratory instruments replacing the verbal instructions. We move into the sound stream as changing vibrations of sound help support our individual intention (sankalpa). Deeply relaxing and instrumental in nature, the sound carries us gently, shifting energy as we go along. This is a wonderful way to experience sound healing for the first time. A more dynamic and activating experience designed around a collective theme and intention, using specifically chosen instruments, including a few that may have more charge for some (binaural beat bowls, tuning forks, gongs, shangs, etc). I also bring my voice into the experience, to support a coherent vibratory field to carry us on the journey. A multitude of instruments used in tandem to support multiple vibrations at once that at times can include vocals. I am accompanied by other sound healers to help hold a full field of sound to bathe in. It can be deeply relaxing, or activating, depending on the focus of the session. It has a highly rejuvenating effect on all levels of the body. An opportunity to participate fully in the sound healing experience. Learn to work with various instruments and your voice to help build a coherent field of sound vibration aimed toward a specific intent. A powerful way to express yourself through sound, while participating in a collective healing experience. On arrival, we’ll have a check-in to determine the most beneficial approach to use for the session. Utilizing a variety of highly vibratory instruments chosen for the purpose of intent, and vocal toning, we’ll move through the treatment checking in as needed as we go along. This is a wonderful way to experience sound healing for the first time. This session uses a variety of tuning forks and crystals both on and off the body to activate vibration through muscle tissue, bones and organs, as well as sending pulsewaves through energetic centres and meridian channels. Tuning forks can have a similar effect on the body as acupuncture, without the needles! Metal bowls are placed on and around your body, while you lie down on a comfy mat, fully clothed. The bowls have a beautiful sustained vibration, that can be felt on the body in mostly a soothing and relaxing way. The vibration created helps shift stagnant energy by activating all levels of the body and shifting brain wave states into deeper modes of relaxation. Using high quality quartz crystal bowls, we’ll utilize the amplifying energy of quartz crystal and the vibratory nature of the bowls to set a sustained wave of healing potential. Crystal bowls will surround you and be hovered over you at times, while played. The nature of this session is deeply energetic. Reiki Drumming is a way of introducing Reiki energy into the auric field using the vibration of specific drumbeats. The drum’s vibration can be felt directly through the body during the session. This session is both activating and relaxing.